Alison Humphrey: "Stratford upon Avatar"
"Today the Royal Shakespeare Company announced a new production of William Shakespeare’s late play The Tempest, produced in collaboration with Intel and in association with leading performance capture company, The Imaginarium Studios. The companies will combine their passion for storytelling and innovation to create a truly revolutionary production as part of the RSC’s winter season 2016. Directed by RSC Artistic Director, Gregory Doran, with RSC Associate Artist, Simon Russell Beale, as Prospero, and designed by Stephen Brimson Lewis, this partnership will see the RSC’s skills at theatre-making come together with Intel’s digital innovation and the expertise of The Imaginarium in pushing technical boundaries to create a truly innovative production for a new generation to mark Shakespeare’s 400th anniversary. For the very first time, performance capture technology will be used to render an animated character - Ariel the sprite - live on the Royal Shakespeare Theatre stage. The technology works by capturing an actor’s facial expressions as well as their movements, which ensures that an actor’s full performance is translated into the animated character. It has most famously been used in films and gaming, but together the RSC, Intel and The Imaginarium have undertaken more than a year of research to bring digital avatars to life on stage in real-time, interacting with live actors." "Today the Royal Shakespeare Company announced a new production of William Shakespeare's play The Tempest, produced in collaboration with Intel and in association with The Imaginarium Studios. The companies will collaborate to create a revolutionary production as part of RSC's winter season 2016. For the first time, performance capture technology will be used to render an animated character live on the Royal Shakespeare Theatre stage. Standard Intel technology is used to manage massive data processing required for live digital content projection - from Intel Xeon to Intel Core i7 processors." I heard some tantalizing murmurs about this plan last summer, and can't wait to see what they and The Imaginarium cook up together! "More than 400 years ago, Shakespeare was busy dazzling his very first audiences with the latest in baffling theatre technology, from trap doors to bursting fireworks and the sound of rumbling thunder. This year, the Royal Shakespeare Company is aiming to conjure the same effect, as it becomes the first theatre in the world to incorporate live digital avatars to join actors on stage. 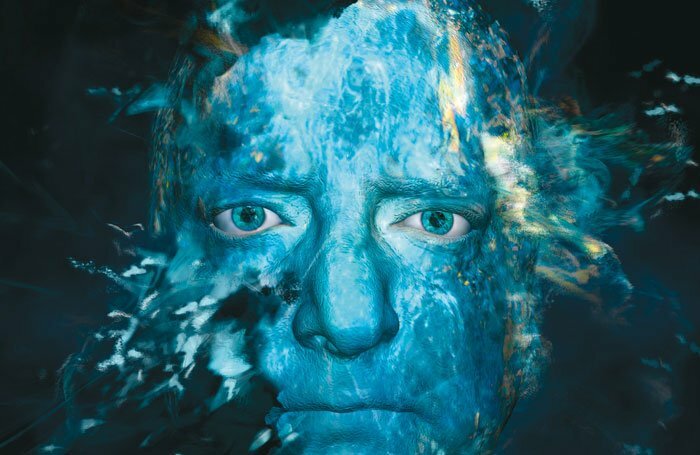 The company has partnered with the very latest digital technology to build an all-action hologram effect, for a new production of The Tempest starring Simon Russell Beale. They will work with the studios run by Andy Serkis, best-known for his astonishing transformation to Gollum in the Lord of the Rings film franchise, and Intel to utilise cutting-edge technology on a live stage for the first time. While the details of the project are still in development, it hopes to transform the character of Ariel into a mystical 3D digital apparition which will react in real-time as it is projected onstage, just as effectively as the human members of the cast. The final version will incorporate and update the technology already used regularly in Hollywood, which sees actors dressed in specially-designed suits, whose movement are then mimicked by a character on screen. Rather than being pre-recorded and projected on stage each night, it is hoped the 2016 Ariel will be seen in live motion capture, with an expert controlling the movements from backstage. The teams are currently experimenting with special effects who allow it to appear covered in fire or water, changing shape to captivate a new generation. Gregory Doran, the RSC’s artistic director, said: 'Shakespeare includes a Masque in The Tempest. They were the multi-media events of their day, using innovative technology from the Continent to produce astonishing effects, with moving lights, and stage machinery that could make people fly, and descend from the clouds. In one such masque apparently, Oberon arrived in a chariot drawn by a live polar bear! 'So I wanted to see what would happen if the very latest cutting edge twenty-first century technology could be applied to Shakespeare's play today. We contacted the leaders in the field, Intel, and they were delighted to come on board. 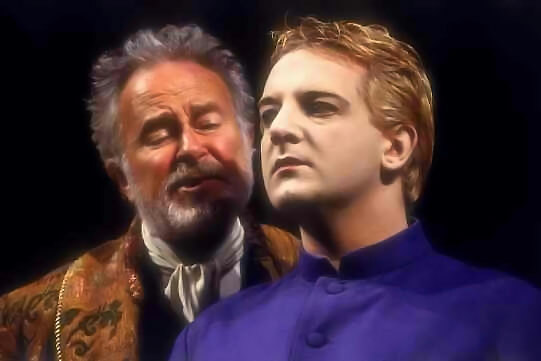 And we have been developing our ideas with them, and Andy Serkis's brilliant Imaginarium Studios to produce wonders...."
Alec McCowan (Prospero) and Simon Russell Beale (Ariel) in Sam Mendes's 1993 Tempest.